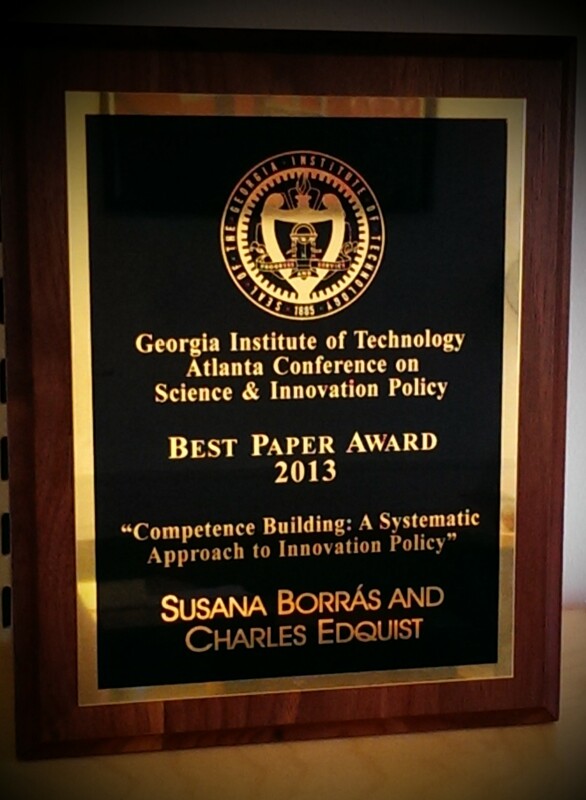 Charles and Susana Borrás received the Best Paper Award 2013 at the Atlanta Conference on Science & Innovation Policy (http://www.atlantaconference.org/), at The Georgia Institute of Technology, 26-28 September 2013. Their paper is entitled “Competence Building: A Systemic Approach to Innovation Policy”. The award was presented during the ceremony at the conference on 26 September 2013. The main question that guides this paper is how governments are focusing (and must focus) on competence building (education and training) when designing and implementing innovation policies. With this approach, the paper aims at filling the gap between the existing literature on competences on the one hand, and the real world of innovation policy-making on the other, typically not speaking to each other. With this purpose in mind, this paper discusses the role of competences and competence-building in the innovation process from a perspective of innovation systems; it examines how governments and public agencies in different countries and different times have actually approached the issue of building, maintaining and using competences in their innovation systems; it examines what are the critical and most important issues at stake from the point of view of innovation policy, looking particularly at the unresolved tensions and systemic unbalances related to competences in the system; and last but not least, it elaborates a set of overall criteria for the selection and design of relevant policy instruments addressing those tensions and unbalances. Tags: innovation, science and innovation policy, systems of innovation. Bookmark the permalink.